IMPORTANT LIFE-SAVING INFORMATION DRIVE!! BE the MATCH Needs YOU! Each and every day over 6,000 physicians scour the Be the Match's donor registry for a LIFE-SAVING match of cord blood or bone marrow for their patients.. That match could be you! 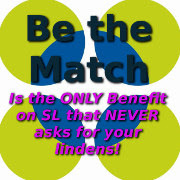 Be part of the ONLY benefit on SL that does NOT ask for lindens! If there is a tip jar, if a kiosk asks you for lindens, it is NOT a Be the Match EVENT. All of our kiosks will be giving out information about Be the Match and sometimes some free gifts. NO LINDENS WILL BE REQUESTED AT ANY TIME! Our kiosks ask people to visit the two websites listed below..
http://www.bethematchfoundation.org/goto/BWBTM IF YOU DONATE a receipt will be sent directly to your email, so you have proof for tax purposes. IT will include the non-profit tax ID. No one on the grid holds your money.. no linden exchange.. direct to the place it belongs without an SL "middle man". All of us at the Be the Match Foundation invite YOU to one of our Be the Match Events spread out over the grid to help get out this life - saving information.October 17th starting Noon at Tranquil Commons.. some wonderful LIVE music and BTM Information..
*October 18th from 6-8pm SLT.. Party with us on the SL Enquirer Yacht with DJ Rory! Prizes and fun. October 21st 10 am slt -Noon SLT Emerald Dreams group is offering a fun surfing contest with great prizes! October 23rd 6pm SLT - October 24th 6pm SLT.. Join us as we ride 25 tracks in 24 hours.. EVERYONE gets a free bike! Many many MC's are joining in, ALL are invited! Be the Match Hard Asses that ride ALL 25 rides will be given Special prizes. Rides will start at the Cobra's World tracks and end at the Biker's Weekly Celtic Knot track.. YOU will see some fantastic tracks and meet great people! October 27th 6pm SLT Nitro Scrubs MC invites you to Be the Match Halloween Costumed ride! Wear your costume.. prizes for best costume, and a haunted house to check out! *So we really, really need your help! 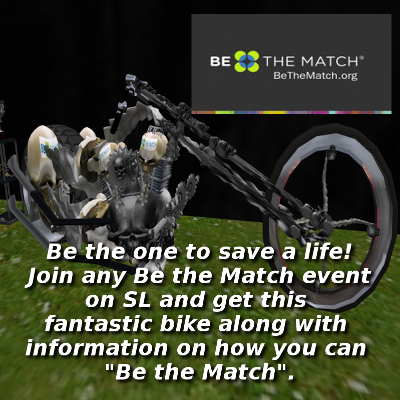 The Be the Match Websites for SecondLife are open NOW and will be running through the 28th atmidnight. Enjoy the Events, find out about Be the Match/ Bone Marrow and Cord Blood Registry, and join, volunteer or donate if you can.. See you soon.